Crewel embroidery or Jacobean Crewelwork was made popular during the 17th Century and could be found adorning elaborate bed hangings and curtains. The technique uses fine wool to embellish shaded designs onto linen and other firm fabrics which are held tightly on embroidery hoops or frames. The origin of this style of embroidery is uncertain but it is thought to be at least a thousand years old and uses techniques and stitches which can be found in Chinese and Japanese embroidery. 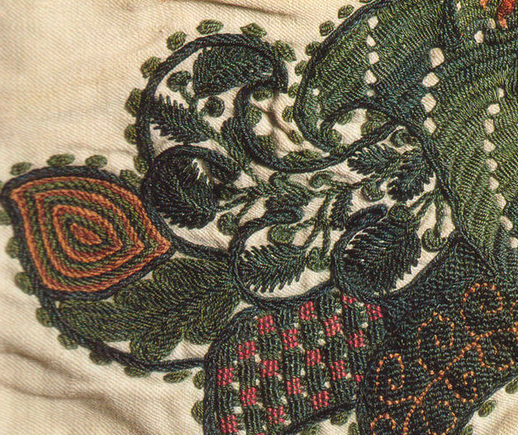 Unlike counted stitch work, designs for crewel embroidery are drawn or transferred directly onto the fabrics to be stitched. Special stitches create a gentle shaded effect and distinctive Chintz style images are associated with this technique. One of the most well known pieces of crewel embroidery is the Bayeux Tapestry.